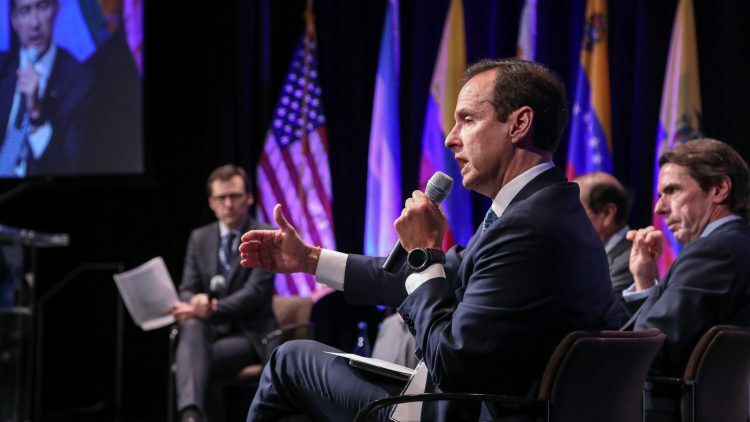 Former heads of state from the Spanish-speaking world joined international luminaries at Miami Dade College in October for a forum discussing the state of democracy and future of political parties across Latin America and the Caribbean. Organized by the Mezerhane Endowed Chair at MDC and the Inciativa Democrática de España y las Américas (IDEA), the forum, titled “Toward the Reinvention of Political Parties,” addressed the role of political parties in modern society, their reinvention in our social media-obsessed culture and the current political landscape in Cuba and Venezuela. The forum included a passionate speech by human rights activist Rosa María Payá, the daughter of the late Cuban opposition leader Osvaldo Payá. The forum – conducted entirely in Spanish ­– was attended by former Prime Minister of Spain José Maria Aznar, former Argentinian Presidents Eduardo Duhalde and Fernando de la Rúa, former Colombian President Andrés Pastrana, former Costa Rican President Miguel Ángel Rodríguez, former Bolivian President Jorge Quiroga, former Uruguayan President Luis Alberto Lacalle, former Ecuadoran Presidents Osvaldo Hurtado and Jamil Mahuad and former Salvadoran President Alfredo Cristiani. In addition, the group was joined by Mezerhane Group President and Diario Las Américas Editor Nelson J. Mezerhane, IDEA Internacional Director Daniel Zovatto, Columbia University professor and Venezuela’s former Minister of State Allan R. Brewer-Carías, Ibero-American Institute of Constitutional Law President Diego Valadés, NTN24 U.S. News Director Gustau Alegret and MDC President Eduardo J. Padrón. In 2016 MDC’s Mezerhane Endowed Chair hosted its inaugural program, which was attended by leaders such as former Mexican President Vicente Fox and former Costa Rican President Laura Chinchilla. Join Us This Weekend at the Miami Book Fair!